Door 6 Entertainment is a South African Entertainment and Event Company that provides top quality Event Management and Entertainment of all genres, including Bands, MC's, Singers, Dancers, Speciality Acts, Illusionists, Team Building ,Traditional African Entertainers and full Themed Shows for Corporate events, launches and functions. Our experienced booking agents will assist you to find the perfect entertainment for your event, ensuring that your event is successful and that our entertainers are a perfect match to your theme and brand. Aside from our artist bookings, our highly experienced Artistic Team is continuously hard at work, creating unique Corporate Entertainment and Themed Shows for Corporate Events and Functions. Have a particular theme in mind? Door 6 offers tailor made Corporate Shows to your specifications, from concept to completion. From our Professional Artist Bookings to our Themed Shows, Door 6 is able to offer a complete and unique package to our Corporate Clients. Our artistic team created three of the longest running Sun City Extravaganzas as well as producing many International Acts and have a passion for what they do. Door 6 Entertainment also specialises in providing a full Event Management service, including venue sourcing, logistics and technical. We believe in ensuring that all our clients expectations are exceeded and that your successful corporate event is our success. Not sure what will thrill your guests? Call us for a free consultation! We love what we do! Our mission is to deliver World Class Events and Entertainment to our Corporate clients by offering the very best Entertainers, Themed Shows, Event Management, Organisation, Logistics and Technical Support including sound, AV, lighting and staging, whilst doing our best to work within client budget. We offer South African Singers, Professional Dancers, MC's, Cabaret Artists, Comedians, Speciality Acts, Unique Entertainers and Corporate Themed Show options that are all the top in their fields and ensure that our clients receive a 5 star service. Door 6 proudly develops talented young South African singers, performers, musicians, choreographers and dancers through training, recording and performance whilst giving them professional guidance and support. Once polished, recorded and professionally trained, they become part of the Door 6 young artist pool. Door 6 offers a one-stop-shop for Corporate Events including the Top Entertainers, Themed Shows, Event Management, Concepts that fit your Brand, Logistics, Technical Support, Team Building and Entertainment for Experiential Events. Our dedicated personnel ensure that once you are allocated an Event Manager, they will be your point of contact and manage your event from concept to completion. 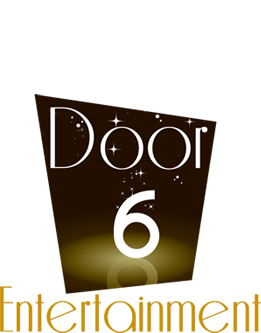 Door 6 also books top South African Artists for our Corporate Clients, and is dedicated to developing young South African singers, dancers, performers and musicians and creating new and exciting Themed Show and Event options to ensure that your Event is unique to your Brand. Call us for a free consultation for your event on 021 782 8976.